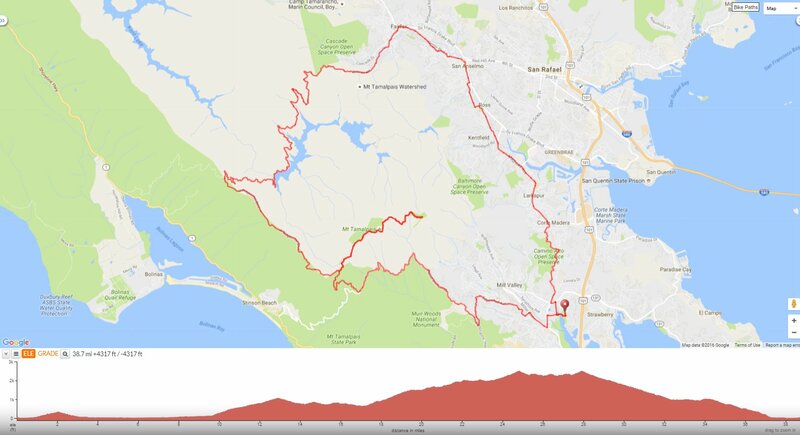 This counter clockwise loop meanders through the city streets from Mill Valley to Fairfax before climbing up Bolinas Fairfax Rd up to Pine Mountain and descending through the gorgeous redwoods to Alpine Lake. It climbs out from the lake up through the redwood forest to W Ridgecrest Blvd for the spectacular run along the top of Bolinas Ridge to Rock Springs. Continue climbing up E Ridgecrest Blvd to the summit of Mt Tam. Contonue north with a climb up Camino Alto; it’s 1.3 miles with an average grade of 4.4% followed by a fabulous sweeping descent on smooth pavement into Corte Madera. The road name changes to Bolinas Fairfax Rd at the Mt Tamalpais Watershed sign. This quiet back road continues to climb for 1.3 miles to the road closure at Azalea Hill Trailhead with an average grade of 5%. Bolinas Fairfax Rd narrows as it winds down through the beautiful redwoods on rolling terrain out to Alpine Lake/Dam! Enjoy the magnificent towering redwoods! Enjoy glorious ridge top vistas! At the gated Air Force Station, the road kicks up with steep grades of 9-15% up to the first high point! Mt Tam-enjoy the phenomenal views! Descend Sequoia Valley Rd and Edgewood to Molina for the return into Mill Valley. Cut across Hauke Park back to the parking lot. *Although Bolinas Fairfax Rd is closed between Azalea Hill Trail and Ridgecrest Blvd, it is passable on a bicycle. There was no heavy equipment, working road crews or loose dirt or other debris blocking the road in either direction. Do ride with care and caution, road conditions may have changed since today’s date. **Update-slide repairs are slated to begin on September 1 and projected to be finished in October. Weather: Sunny and HOT! Temps ranged from the mid 60’s to the low 100’s with SW winds.